Marcia from "Promptuarii Iconum Insigniorum "
Marcia was the second wife of Marcus Porcius Cato Uticensis (Cato the Younger) and the daughter of Lucius Marcius Philippus. She was born about 80 BC. There is little information known about Marcia other than in regard to her marriages to Cato and Hortensius. After Cato divorced his first wife Atilia because of rumors about her infidelity, in 63 BC, he married Marcia, "a woman of excellent reputation, about whom there was the most abundant talk" (Plutarch). Marcia bore him two or three children; however, there is controversy about whether or not she was pregnant with this third child at the time of her second marriage to Hortensius. There is no indication that their marriage was unhappy: Plutarch relates that Marcia was concerned for Cato's safety, and Appian says that Cato was extremely fond of Marcia. Marcia's second marriage, in the year 56 BC, was to the renowned orator and advocate Quintus Hortensius Hortalus, whom Cicero styled as "king of the courts". Hortensius was an admirer and friend of Cato’s, and he was eager to be more closely related to Cato and his family. Although Hortensius' own wife, the daughter of Quintus Lutatius Catulus, had just died without leaving Hortensius an heir, an alliance with Cato seems to be the chief reason for Hortensius, nearing 60 years old, to request to be married to Cato’s daughter Porcia, who was only about 20 years old at the time. However, because Porcia was already married to Marcus Calpurnius Bibulus and the age difference was so great, Cato refused to give his consent. Hortensius immediately suggested that he marry Marcia instead because she had already borne Cato his heirs. Due to Hortensius' ardor, Cato acquiesced, but only on the condition that Marcia's father, Lucius Marcius Philippus, approve as well. With Philippus' consent obtained, Cato divorced Marcia, thereby placing her under her father's charge. Hortensius promptly married Marcia, and she bore him an heir. After Hortensius' death in 50 BC, she inherited "every last sesterce of his estate". At the outbreak of the civil war in 49, Marcia and her children moved back into Cato’s household. Plutarch asserts that Cato remarried Marcia after Hortensius's death, whereas Appian's histories relate that Cato merely reestablished her in his own household. Either way, this caused a minor scandal, as after Hortensius' death, her return made the household rich. Julius Caesar accused Cato of wife trafficking and marrying Marcia off to Hortensius simply in order to gain his wealth. "For why," said Caesar, "should Cato give up his wife if he wanted her, or why, if he did not want her, should he take her back again? Unless it was true that the woman was at the first set as a bait for Hortensius, and lent by Cato when she was young that he might take her back when she was rich." However, this is generally thought to be political mudslinging as, Plutarch asserts that in actuality, in 49 BC Cato was fleeing Rome with the rest of the aristocracy with Pompey as a result of Caesar's approach. Because of his impending absence, he needed someone to look after his young daughters and household in his place, which Marcia did. 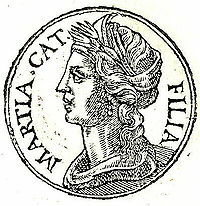 Plutarch described Marcia as "...a woman of reputed excellence, about whom there was the most abundant talk..." Appian suggests that Cato was extremely fond of her. Many assumptions have been made regarding Cato's character based upon his endorsement of the marriage between Marcia and Hortensius. Appian said that "as a girl; [Cato] was extremely fond of her, and she had borne him children. Nevertheless, he gave her to Hortensius, one of his friends,— who desired to have children but was married to a childless wife..." This sacrifice is used by Plutarch and other historians to illustrate Cato's honorability and his willingness to sacrifice a wife he liked in the name of friendship. This positive interpretation of Cato's character is reflected in Lucan's Pharsalia and how the Uticans mourned his death. In her Masters of Rome series of novels, Colleen McCullough suggests that Cato gave Marcia to Hortensius simply because he could not reconcile his passion for her with his Stoic ideals, that he never let her go emotionally, and that he took her back at the first opportunity. •Plutarch and the Family of Cato Minor. Thomas Means; Sheila K. Dickison. The Classical Journal, Vol. 69, No. 3. (Feb. - Mar., 1974), pp. 210-215 at JSTOR. •Dictionary of Greek and Roman Biography and Mythology. William Smith (1867). Ancient Library, Vol. 2, pp. 939–940. ^ Rome's Last Citizen: The Life and Legacy of Cato, Mortal Enemy of Caesar by Rob Goodman and Jimmy Soni, pg 225.